Xiaomi, the privately owned Chinese smartphone manufacturer headquartered in Beijing seems not to have release any tablet for quite some time. This might be because of a decline in the sales of tablets, but this never stops Xiaomi. A new report coming from a popular Chinese analyst Pan Jiutang states that Xiaomi could be looking to get in on the action with a new Windows 10 Mi tablet this year, which unfortunately could be anytime from now to September. Xiaomi has focused more on the Android devices, and a transformation from the Android OS to Windows 10 seems to be a brave move for the Chinese manufacturer. 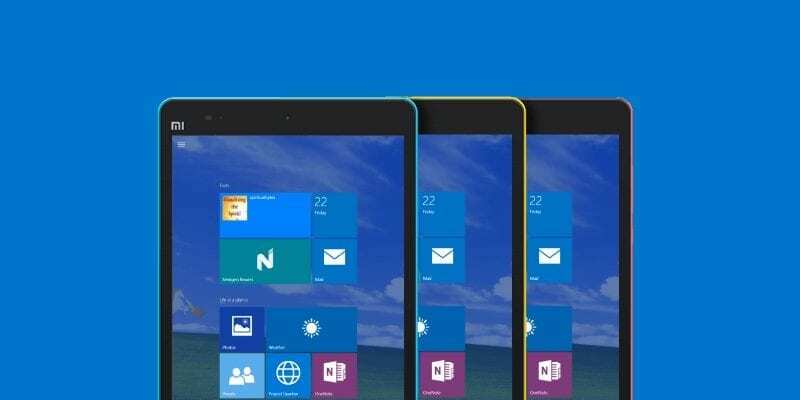 Although, we are not quite sure if the tablet will be running on the newly released Windows 10 OS for PCs or the Windows 10 Mobile version which is yet to be rolled-out by Microsoft. Some of the tablet leaked specifications include a 8-inch display on the Xiaomi that features a 2.2GHz Nvidia Tegra K1 processor with 192-core Kepler GPU, a 2GB of RAM, 16GB built-in storage that can be expanded up to 128GB using a microSD card. It sports an 8-megapixel back camera with a front snapper of 5-megapixel for groupies and selfies, and a non-removable 6,700mAh battery. On the software front, the tablet runs on MIUI 6. We could expect the launch to be on August 16, the time when the company traditionally announces the new MIUI version. So, let’s wait for some more concrete details about the new tablet.